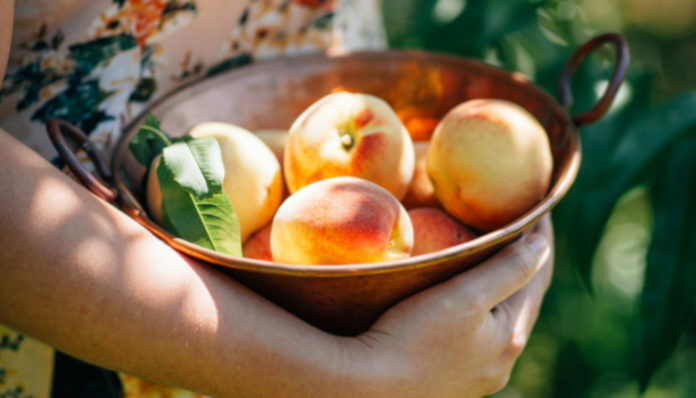 August 22 is National Eat a Peach Day, but for my Texas family, peach season ended in late June, after we finished harvesting from the tree in my parents’ backyard. By mid-July, temperatures get well into the 100’s, and most crops tend to scorch around that temperature. For me, the end of peach season brings something even more wonderful — we’ve processed and frozen the harvest, so it’s time to make a mess of pies. What is it about fruit pie that makes us dream of summer days at the public pool, riding bikes through our neighborhoods, and telling ghost stories at summer camp? Every summer, I make a handful of pies with my dad’s peaches, and every summer, I feel the bittersweet sting of nostalgia as I peel the fruit and roll out the crust – a longing for days that my head knows weren’t necessarily better, but that my heart yearns to relive. Millennials are particularly prone to attacks of nostalgia. We like to think about when times were simpler, before social media and this constant pressure to perform for everyone and no one. There is a distinct delineation in our lives, a thin line on one side of which exists our simple, analog life, on the other side a mess of constantly-changing technologies and social pressures. Childhood and adulthood. Sense and chaos. But, every decade has its political upheaval and social strains, and times were never truly simple for anyone. We were just young, and nothing existed that wasn’t right in front of us. The things in front of us were swimming pools, bikes, and summer camp. We were the thing that was simple. Simple, but not simplistic. Kind of like peach pie. Fruit pie is an American summer staple for lots of reasons, one of which is accessibility. Have you ever tried to make a custard pie or some crap like that, especially in the heat of summer? Takes forever, and you’ll roast your face off in that hot kitchen. But, peach pie is different. The fruit literally falls from trees for weeks; all you have to do is roll out a crust (that, *ahem* may or may not come from the frozen section), add some sugar and spice, pop in the oven, and you’re done. Baking peach pies is a beautifully tactile experience that, for me, hearkens back to those seemingly simpler times. Preparing the fruit is a sticky, silly process that I can complete without worrying about SEO and audience engagement. Creating a lattice crust is an eyeball-it kind of thing that I know will end deliciously, even if it’s not Instagram-worthy. I get to play with spices and textures for the filling, knowing that whatever I do, it’s eventually going to turn into pie. I ruminate more over which Snapchat filter I’m going to use than over my cinnamon-to-nutmeg ratio. No real worries there. It’s easy for members of our generation to emotionally drown in their own nostalgia. But, I think there’s a way to channel those feelings of longing and use memories of simpler times as a calming force for a chaotic present. We all have our own vehicles to turn remembrance into respite. If you haven’t found yours yet, maybe start looking today. Maybe, start by eating a peach.